Description: London, Warne & Co. 1888 Chromolithograph frontispiece and chromolith. text illustrations (95) by Constance Haslewood. . Octavo chromolith boards with dancing children repeated on both cover (rebacked/pink stain to one cover/tips worn) 96pp New EPs and a few signs of use but no tears, scribbles or foxing. Nice bright illustrations in the style of Kate Greenaway. 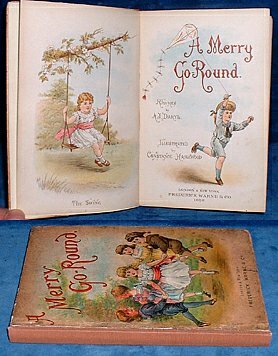 A charming collection of Rhymes each page with a half page color chromolith really quite scarce.